This post contains major spoilers for The Last Jedi and previous Star Wars films. No matter where you stand in the hullabaloo surrounding Star Wars: The Last Jedi -- love it? hate it? -- there’s no denying the sheer power of the film, which is a box-office behemoth, with the second highest-grossing opening weekend of all time (behind The Force Awakens), and a hit with critics, tied with The Force Awakens as the second best-reviewed Star Wars film on Rotten Tomatoes (with The Empire Strikes Back at number one). Length-wise, it’s the longest-ever Star Wars film, besetting Attack of the Clones. It’s a film that demands attention, goes boldly in new directions, and redefines the very notion of what makes a Star Wars film. While that bold new direction is a sticking point for some fans, The Last Jedi is still firmly set in the Star Wars galaxy we’ve always known. There are countless references to the original trilogy: Yoda, Princess Leia’s hologram, blue/green milk, "I’ve got a bad feeling about this" (said in BB-8 droid speak this time around). There’s even a neat connection to a throwaway line in Rogue One. Now that Disney owns Lucasfilm, plenty of diehard fans have mocked the decision to distance the sequels from the lore established in George Lucas’s maligned prequel trilogy. But though The Last Jedi steers clear of any super-direct references -- no one goes to Coruscant, no one namechecks Mace Windu -- it has a concrete awareness of what happened in the days before the Galactic Republic was overthrown by the Empire. Some of the references are direct, some more visually poetic, but director Rian Johnson is definitely not afraid to tackle the history Lucas laid out. Here are all of the nods to the prequels we caught in The Last Jedi. After killing Snoke and his Praetorian guards, Kylo temporarily fools Rey into believing he might join her on the light side. But that was never his intent; instead, he gazes longingly at the Supreme Leader’s vacant throne, revealing his selfish motivation for power. In an effort to woo Rey to join him, he tells her that together they will do away with the Jedi and the Sith. 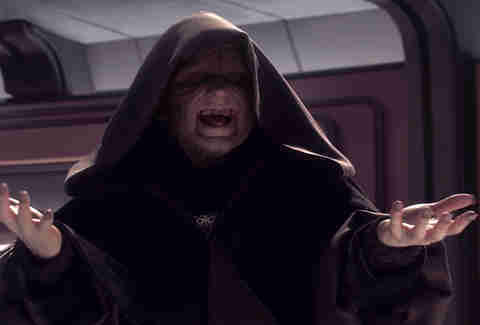 The word "Sith" stems directly from the prequels and was never uttered in the original trilogy. It may be a small nod, but it still shows that the film isn’t totally absolving itself of what came before. 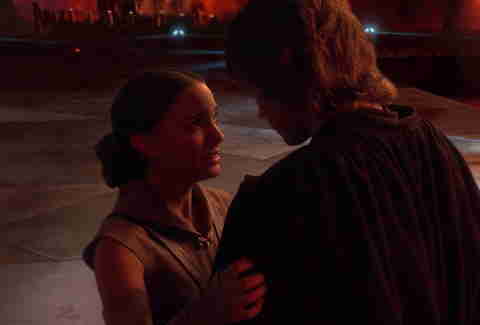 That moment between Kylo and Rey is also very reminiscent of Anakin’s plea to Padme in the third prequel, Revenge of the Sith. When Padme discovers that Anakin has gone to the dark side, she journeys to the volcano planet Mustafar to sway him back to the light. But Anakin is fully gone by this point, well on his way to becoming Darth Vader. Still, his love for Padme shines through; he tells her he can overthrow Sidious and that "together you and I can rule the galaxy." This is almost identical to what Kylo offers Rey, and shows that he lived up to what his grandfather Anakin only teased: killing his master. The scenes are even visually similar, the flames from Snoke’s destroyed throne room echoing the lava from the Mustafa volcanoes. That throne room moment isn’t the only time in The Last Jedi that we see shades of Anakin in Kylo Ren. Eagle-eyed fans caught a visual reference in the first trailer that appears in full context in the final film. Just as Anakin and his Clonetroooper cronies are framed from above after going full-evil in Revenge of the Sith, Johnson hovers over Kylo as the new Supreme Leader infiltrates Crait’s Rebel base with a battalion of Flametroopers. Another thing Kylo inherited from grandpa? His show-off piloting tricks. In The Phantom Menace, a young Anakin tries a spinning maneuver that becomes his trademark in the other prequel films ("Let’s try spinning, that’s a neat trick!"). Kylo Ren does the exact same barrel-roll movement in his TIE fighter in The Last Jedi, right before he almost shoots down his mother, General Leia Organa, in her Resistance ship. Feel free to argue this one, but it certainly feels like a visual parallel. In The Last Jedi, evil, Force-wielder Snoke is killed by Kylo Ren in a moment that evokes evil Force-wieler Darth Maul’s death in The Phantom Menace. Both villains are surprised when they’re struck down with a lightsaber, and in both cases we see close-ups of their faces before the reveal that they’ve been cut in half. 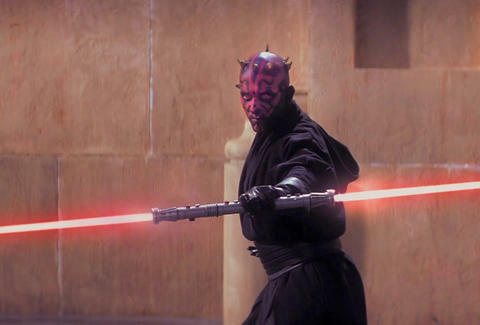 If you watch Rebels, you’ll know that Maul survived his injuries, only be killed again by Obi-Wan on the desert planet Tatooine. It seems a little less likely that Snoke survived his encounter -- we get a definitive-looking close-up of his dead face with his tongue hanging out -- but this is Star Wars, a series where no one is ever truly gone. In The Phantom Menace, we learn that Anakin Skywalker was immaculately conceived by the Force to bring a prophesied balance. As with most fictional predictions, the mystical interpretation was incorrect, as it was all a bit more literal: he brought balance to the Force by destroying the last of the Jedi Order. Jump to The Last Jedi, where we learn that Rey is a nobody. Her parents sold her off for drinking money. But as Snoke insinuates, there’s a little more to Rey than that. She’s the Force’s "answer" to Kylo. "The darkness rises, and light to meet it." It seems like the Force is attempting another balancing act by tempering Kylo’s immense raw dark-side power with Rey’s light. 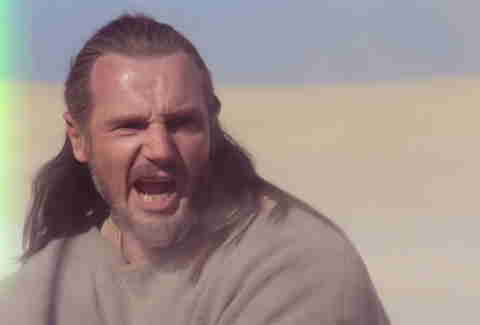 She may not be a "chosen one" in a Jesus way like Anakin, but she’s still special in a way that other desert-dwelling slave was. This is definitely the most fun prequels callback in The Last Jedi. On the island planet of Ahch-To, Luke refers to a lightsaber as a "laser sword." This is what a young Anakin calls them in The Phantom Menace. 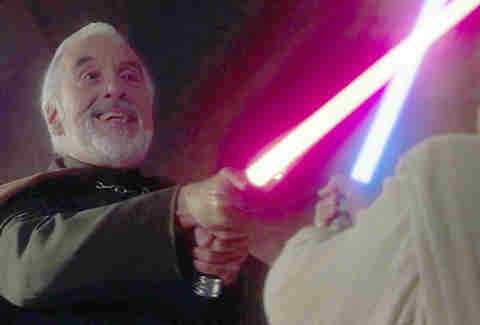 It’s also a deeper in-joke than just that; George Lucas also refers to the blades as laser swords.